University President John Hennessy will be moderating the Three Books reading program for the Class of 2019. (SEAN CHRISTOFFERSON/The Stanford Daily). 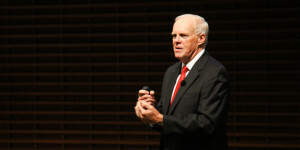 In a letter addressed to the incoming Class of 2019 and transfers, President John Hennessy announced the three books for the Three Books reading program this coming academic year: “The Innovators,” by Walter Isaacson, “This Boy’s Life,” by Tobias Wolff and “Cane River,” by Lalita Tademy. Hennessy was invited to be the faculty moderator for Three Books 2015 by the Office of the Vice Provost for Undergraduate Education — according to Robert Urstein, dean of freshmen — an offer which Hennessy accepted. “The Class of 2019 will be entering in the 125th year of the University, so we thought it was an appropriate opportunity to invite President Hennessy to lead the program this year,” Urstein said in an email to The Daily. Hennessy, in his letter addressed to the incoming students, admitted the difficulties of choosing the books for the program before settling on his final decision. “This Boy’s Life” is a memoir of Tobias Wolff, who is currently a professor in the English Department at Stanford. Wolff describes his adolescence traveling with his mother across the continental United States. “Cane River,” an epic spanning four generations of African-American women, is based on author Lalita Tedemy’s ancestors. The story begins in the antebellum days of slavery and ends decades later, providing a story about the lives of Tedemy’s ancestors rather than just numbers and statistics surrounding slavery. “Cane River” was not only a New York Times bestseller but also an Oprah’s Book Club Pick. Hennessy also mentioned that this year, there will be a website dedicated to the books and their authors’ information, where incoming students would also be able to find the online space to discuss about their readings among each other as well as other Stanford faculty. This will be done using the Stanford In Your Class platform. A previous edition of this article stated that the website for the Three Books program will be done in collaboration with Stanford Online, however, Stanford Online was used in the previous two years whereas this year, the platform Stanford In Your Class is being used. The Daily regrets this error.